Three years ago, I was in the woods near Boone with a bunch of fellow volunteers wrestling big, mud-caked stones into a line. When we leaned back to admire the short stretch of path we’d created, I have to admit, I doubted the dream of this expertly designed, highly challenging mountain bike park in the High Country would ever be realized. Several years, 4,000 volunteer hours, and $2 million later, the frenzy of trail work is over: Rocky Knob Park is ready to ride. Sections of this biking hub have been getting a workout since 2011, when the first trail, Rocky Branch, was finished. Since then, the emerging eight miles of trails have crept up stone-ribbed, boulder-strewn Rocky Knob. A grand opening in April christened this system, where stacked loops and circuit rides lead from the parking lot at 3,240 feet to top out at 4,000, near the highest pinnacle. You won’t find a bona fide beginner trail at Rocky Knob, so the best starting point is the moderate, 1.6-mile Rocky Branch route, where impressive gravel paths wind through rock gardens and across bridges of hand-split locust logs. The Rocky Branch ride passes the easiest of the park’s three skills areas, spots along the trails where a concentrated set of features invite you to play and fine tune your technical skills. This beginner area called Jump Start has a mini-pump track, undulating terrain where riders can work on carrying or increasing momentum without pedaling, as well as jumps and easy ground-level features. The one-mile Middle Earth trail circles from Rocky Branch to two loftier paths and leads to Stone Binge, an awesome intermediate/advanced skills area. Ramps take riders over boulders, and features are rated for difficulty on a one-to-five chili pepper scale, ranging from mild to wild spicy. This skills area exits across some of the most impressive portions of stone-paved trail. If you’re hitting your limit on the way up Middle Earth, pull off before Stone Binge and have some fun in the Skinny skills area by tackling Logzilla, an 84-foot long, 12-inch wide log ride, and other challenges. The trails wind ever higher above a swath of power lines that separate the lower knob from the uppermost peak and Boat Rock Loop. The next 3.6 miles have serious climb to them, but the Boat Rock Bailout provides relief for riders who want to stick to the lower 2.5 miles of the route. You’ll see plenty of steep, rocky ups and downs on this section, but the hardest, bumpiest ride leads to the summit. Pat yourself on the back if you’ve made it this far, and then saddle up for the very difficult Ol’ Hoss, with its tight, rocky switchbacks and drops that guarantee plenty of heavy breathing. If you finish this last loop, you will have conquered a total of 750 feet of elevation gain on a 4.5 mile ride. When you’re ready for downhill thrills, take the PBJ trail plummet, named for its pumps, berms, and jumps. Here, the seriously skilled rider can get big air. The Bring It Home Berm provides an exciting finale on Rocky Branch. Not a biker? Hikers are welcome too. Opposite directions of travel for each group mean you’ll see each other coming. In the parking area, a playground by Beanstalk Builders of Morganton has been popular since day one. Made of wood and ropes for a tree house effect, the playscape gives kids an adventure as well. There’s more to come, with a true beginner-level pump track expected to open near the parking area by fall. And while the playground and access for hikers make Rocky Knob a multipurpose amenity, the true goal is to crown Boone a mountain biking destination. The 2010 Boone Area Outdoor Recreation Summit sponsored by the Watauga County Tourism Development Authority germinated the idea to create Rocky Knob. Out of that gathering came a High Country outdoor recreation plan that was novel for a tourism organization. “We kept hearing that mountain biking enthusiasts would ask at local bike shops ‘where are the trails,’ and the answer was ‘there are none,’ ” says Wright Tilley, executive director of the tourism authority. That feedback helped convince the WTDA board that outdoor recreation was an appropriate initiative. Rocky Knob was the group’s first major project. 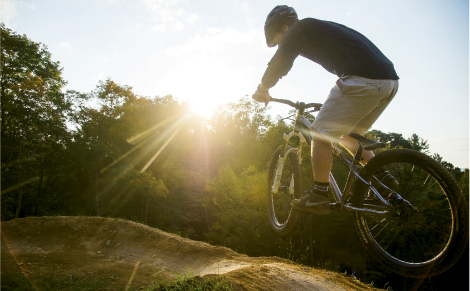 The promise of a stellar mountain bike park energized the local cycling community, and with the help of the WTDA Recreation Planner, Eric Woolridge, the Boone Area Cyclists group was born. Rallying around Rocky Knob, members collaborated with the designers and provided the manpower to finesse the trails. Inspired by the zeal of BAC’s founding president Paul Stahlschmidt and trail boss Kristian Jackson, volunteers showed up to log thousands of hours. Tilley and Stahlschmidt see the park as a part of the larger recreation picture in the High Country. “The spokes go out from here,” Tilley says, noting the park is close to Beech and Sugar mountains’ bike trails, which feature chairlift access. And the stellar trails at Wilkesboro’s W. Kerr Scott Reservoir are just 45 minutes away.